One teen inspired it all. One teenager's spin on the "Glo Up" Twitter trend has sparked an influx of equally heartwarming photos. Florida native Caitlin Crowley hopped on the social media trend of posting "glo up" photos, aka juxtaposing photos of people looking dorky and awkward before and during puberty with photos of them looking attractive and confident afterwards. She shared a photo of herself at a freshman dance with her male friend Dylan and and another with her current girlfriend, Kirrin Chew, on Twitter on Oct. 22. "Freshman to senior year, does this count as a glo up???" she captioned the photos. 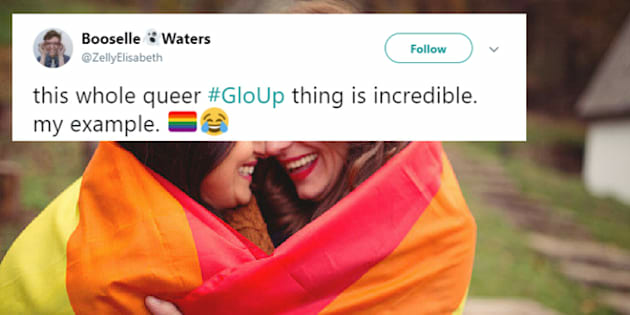 The 17-year-old's tweet went viral and inspired other LGBTQ people to share their own, equally powerful "glo ups" with the hashtag #gloup. Some shared similar photos of themselves with their current partners. Others wrote that when they were single, embracing themselves led to them "glowing up." And some transgender users shared photos of themselves before and mid- or after transition. Crowley, who has been dating her girlfriend for a year but only came out fully around six months ago, told Buzzfeed that she had posted the photos as a joke between her friends. She wasn't expecting the post to blow up as much as it had but told Business Insider she hoped the hashtag would have a positive impact on people. "I hope all the posts from this thread echoes to all the young people still in the closet letting them know they're not alone," she said. "I think the thread of posts served as a form of community and validation through representation to all who participated, and the rest of the audience."